As with most new technologies, drones are rapidly evolving to become smaller and lighter. 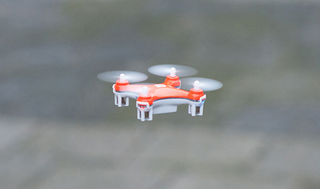 The SKEYE Nano Drone, for instance, can fit in the palm of your hand, but can still pull off impressive tiny aerobatics — and Gizmodo readers can grab one for just $34.99 – that's 41% off. At $34,99, it's great for the holidays. This deal is available both in the US and internationally (select your location on the product page), and shipping is free. The SKEYE comes with a 90-day manufacturer's warranty. Find out more via the link below. Note: order before 12/8/14 to guarantee delivery before Christmas.